Horology (via Latin horologium from Greek ὡρολόγιον, from ὥρα hṓra "hour; time" and -o- interfix and suffix -logy; literally "the study of time") is the art or science of measuring time. 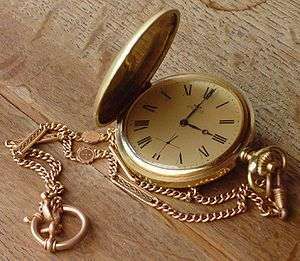 Clocks, watches, clockwork, sundials, hourglasses, clepsydras, timers, time recorders, marine chronometers and atomic clocks are all examples of instruments used to measure time. In current usage, horology refers mainly to the study of mechanical time-keeping devices, while chronometry more broadly includes electronic devices that have largely supplanted mechanical clocks for the best accuracy and precision in time-keeping. One of the more comprehensive museums dedicated to horology is the Musée international d'horlogerie in La Chaux-de-Fonds (Switzerland). The Musée d'Horlogerie du Locle is smaller but located nearby. One of the better horological museums in Germany is the Deutsches Uhrenmuseum in Furtwangen im Schwarzwald, in the Black Forest. The two leading specialised horological museums in North America are the National Watch and Clock Museum in Columbia, Pennsylvania, and the American Clock and Watch Museum in Bristol, Connecticut. An example of a museum devoted to one particular type of clock is the Cuckooland Museum in the U.K., which hosts the world's largest collection of antique cuckoo clocks. ↑ "horology". Online Etymology Dictionary. ↑ ὡρολόγιον, ὥρα. Liddell, Henry George; Scott, Robert; A Greek–English Lexicon at the Perseus Project.